Pre-harvest sprouting – germination of the grain while it is still in the head – can cause costly losses in Prairie cereal crops, so research is underway to develop tools and knowledge for more efficient breeding of elite wheat and barley varieties that better resist or tolerate pre-harvest sprouting. “Pre-harvest sprouting causes a substantial reduction in yield and quality because it degrades the starch,” notes Belay Ayele, an associate professor at the University of Manitoba who is leading this research. Wheat and barley grains affected by pre-harvest sprouting have a high activity of alpha-amylase, an enzyme that is produced during the germination process. Alpha-amylase breaks down the starch in the seeds to provide energy for the growth of the new seedlings. This degradation of starch into sugars causes significant grain quality losses. For example, flour from sprouted grain with high alpha-amylase activity has poor baking quality, and malting barley grain with high alpha-amylase activity can quickly lose germination capacity during storage, so it needs to be malted as soon as possible after harvest. Ayele’s expertise is in plant hormones, so he is looking at the problem of pre-harvest sprouting in that context. “Plant hormones are plant-produced compounds that regulate growth processes within a plant, including seed germination and dormancy,” he explains. His research is focused mainly on the two major plant hormones involved in the control of seed dormancy and sprouting: gibberellins and abscisic acid (ABA). These hormones have opposing roles in a seed: gibberellins promote germination and ABA promotes dormancy. “Depending on the levels of these two hormones or the sensitivity of the seed to these hormones, seeds can be dormant, meaning that they cannot germinate, or seeds can be susceptible to pre-harvest sprouting, meaning that the strength of dormancy is lower,” Ayele says. Ayele’s research is targeting intermediate dormancy – an optimal balance between too much and too little dormancy. This would enable the seeds to tolerate or resist pre-harvest sprouting while also having good and timely germination when seeded for the next crop or during the malting process in the case of malting barley. To create this intermediate dormancy, he is aiming to balance the amounts of ABA and gibberellins in the seed. His current studies in both wheat and barley focus on ABA. A major task in these studies has been the identification of genes involved in the regulation of the ABA level in each crop. Gene identification was especially challenging in wheat. Ayele explains, “Genomic studies of wheat were lagging behind other crops because wheat has a very large, complex genome. We had to start our work from scratch using genomic research from other cereal crops, such as rice, corn and barley. Their genomes are not as complex as wheat’s genome, so there was more information available about them at that time.” Fortunately information on the wheat genome is growing; a whole genome assembly of a bread wheat variety was completed in 2016 and a high-quality bread wheat reference sequence is expected soon. Ayele and his research team recently succeeded in identifying various genes in wheat that influence ABA levels in the seed. Some of these genes are involved in the formation of ABA and others are involved in the degradation of ABA. biological processes and then they apply their learning to crops. By using the ABA-formation and ABA-degradation genes, Ayele and his team found they could manipulate the amount of ABA in the model plant’s seeds to induce dormancy or tolerance to pre-harvest sprouting. Now that they have confirmed the functionality of the identified genes, Ayele and his team are collaborating with researchers from Agriculture and Agri-Food Canada (AAFC) to find particular alleles of the identified genes. 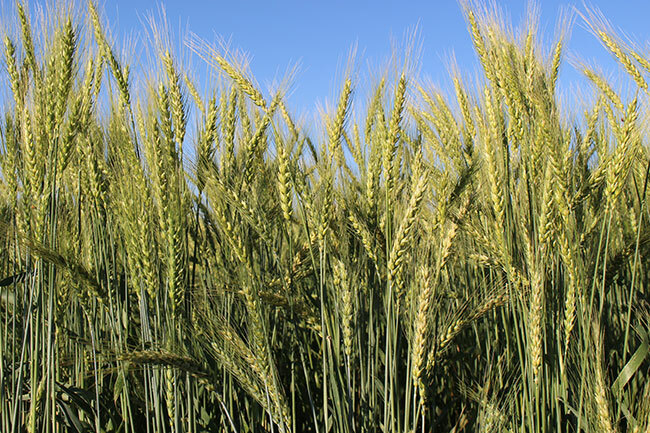 An allele is one of two or more alternative forms of a gene; the researchers want to find alleles that produce an optimal level of ABA to achieve intermediate dormancy in wheat seeds. 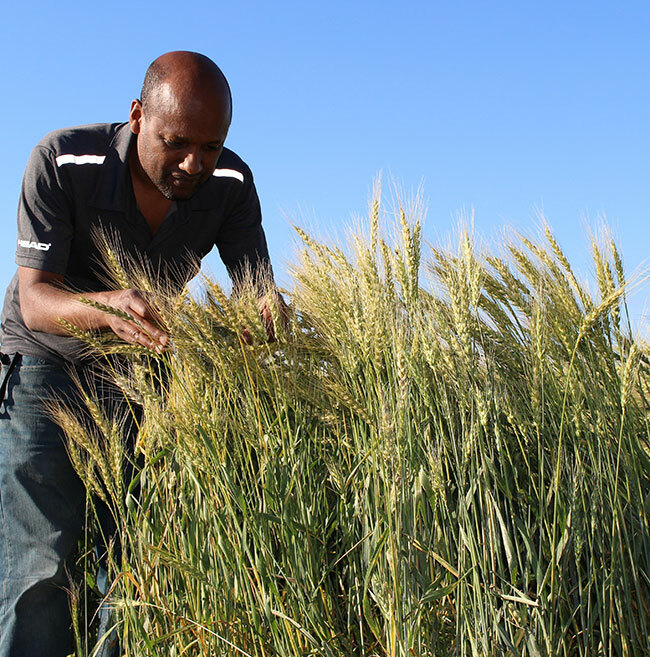 Ayele and his team are taking a similar approach to their malting barley research. They have already identified various ABA-related genes in barley and are characterizing and assessing these genes. 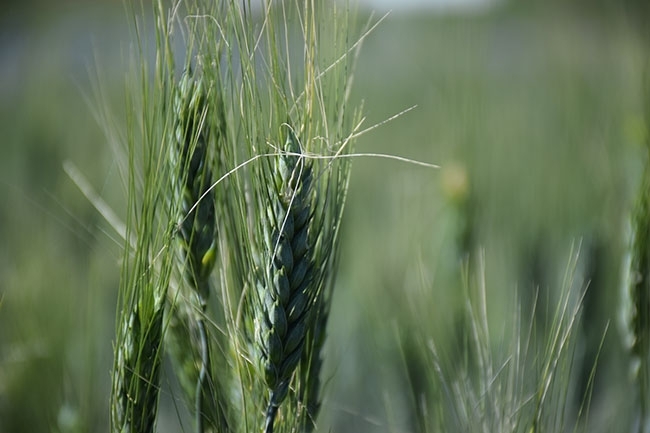 Currently, in collaboration with AAFC researchers at the Brandon Research and Development Centre in Manitoba, they are evaluating barley breeding lines and germplasm from several sources to find the alleles that are optimal for moderate dormancy in barley seeds. The researchers will apply their findings in developing molecular tools to accelerate breeding of elite barley cultivars that are less susceptible to pre-harvest sprouting but still suitable for the malting process, resulting in improved crop yield and quality. For both wheat and barley, faster development of varieties with better pre-harvest sprouting tolerance “will, in turn, help farmers to supply quality grain to domestic and international markets, and thereby they will maintain their competitive edge in the marketplace and maximize their farm incomes,” Ayele says. The main funders for Ayele’s pre-harvest sprouting research are the Western Grains Research Foundation and the Manitoba Wheat and Barley Growers Association, along with the Natural Sciences and Engineering Research Council of Canada, and two Growing Forward 2 programs: the National Wheat Improvement Program and the Manitoba Grain Innovation Hub. Abscisic acid (ABA): Major plant hormone involved in the control of seed dormancy. Alpha-amylase: Enzyme that is produced during the germination process, breaking down the starch in the seeds to provide energy for the growth of the new seedlings. This degradation of starch into sugars causes significant grain quality losses. Arabidopsis: Called the “model plant” because the species is very easy to use in laboratory experiments due to its size and short life cycle, and its relatively small genome was the first plant genome to be sequenced. Gibberellins: Major plant hormone involved in the promotion of germination. Intermediate dormancy: Optimal balance between too much and too little dormancy. Enables seeds to tolerate/resist pre-harvest sprouting while also having good and timely germination when seeded for the next crop (or during the malting process in the case of malting barley). Pre-harvest sprouting: Germination of the grain while it is still in the head.